I don’t seem to be making huge progress with anything but yet seem to be silly busy with lots of things. 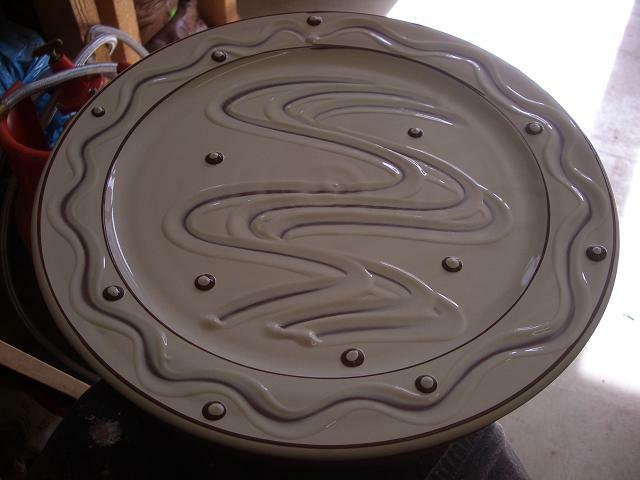 It’s suddenly that time again and the Scottish Potters Newsletter needs putting together, this time I have more than enough to go in it, too much in fact, I think we might be rash and go with 16 pages instead of 12 this time. I bet I won’t have that problem with every edition though. I am slowly slowly making pots but they seem to be hanging around at every stage for weeks on end which I think may be a small exaggeration but it’s certainly what it feels like and what with Spring Fling being just around the corner I should be far more in control. The kiln is growing but again slowly, I know it’s something that will eventually get there, Jason is coming back on wednesday and we’ll hopefully get the roof of the chamber in place. Fingers crossed. I did manage to get some pots decorated this afternoon, some more of the Humbug mugs and a couple of ordered plates. There’s more to do tomorrow and I have a big list of things to be thrown as well. 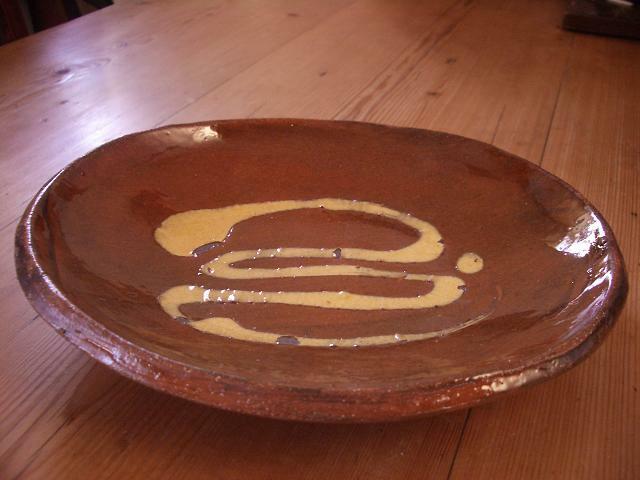 This weekend’s surprise was an email from Debbie my potter friend who lives in the Caribbean saying she was back in the UK, only just here before the volcanic ash stopped the flights, just for a week and that she was going to be in Manchester. I was a bit sad that I couldn’t get down to Manchester to see her because I had so many things happening and a couple of meetings booked that couldn’t be moved. Then another message that her dad was travelling north and could drop her off down in Lockerbie on sunday night and collect her again monday lunch time. Needless to say we hatched a plan and I went to get her last night. Deb is a star, she causes chaos and cheer wherever she goes and I just love her to bits. 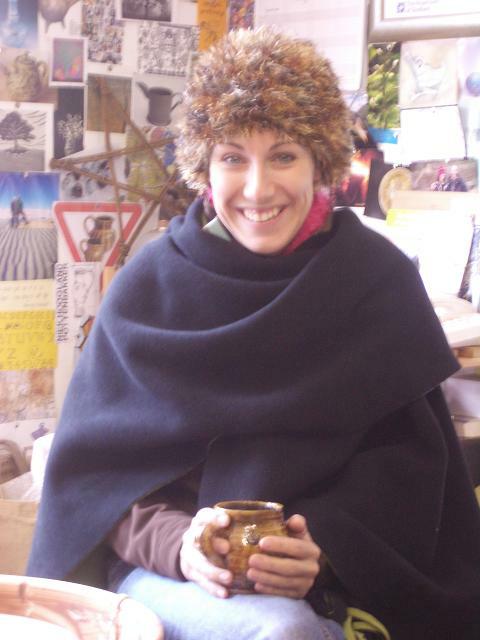 We had a very late night catching up on everything and anything and then the morning at the workshop where she was feeling the cold somewhat even though it was a beautiful sunny day. Here she is nursing a warming cup of tea in a Doug mug. Just as I was off to drop her at the bus stop I had two more surprise visitors who were popping in on their way north. Great to see you John and Angela, it was great to be able to finally show them where I am, we usually meet at shows you see. They are incredibly kind people and brought me some plants for the garden and – how lucky am I- this great dish in the picture above. 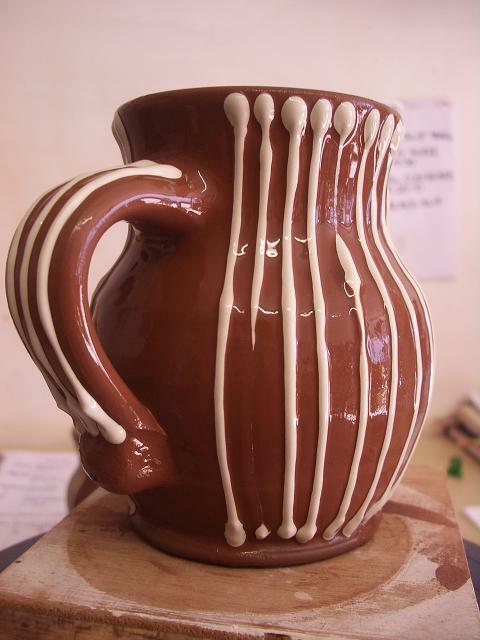 It’s been made by Geoff Fuller a slipware potter in Derbyshire, he has been working on making replicas of some old pots and trying to recreate the exact colours and feel. Now if that swirl of slip isn’t enough to make you squirm then I don’t know what is. It’s fast and confident but incredible simple and beautiful all in the one go. That takes some practise getting it just so in the middle of the dish. I was very touched with the gifts so thank you again. 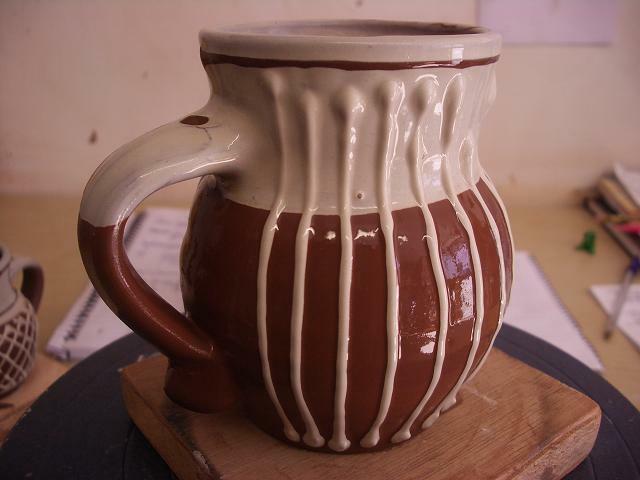 This entry was posted in Debbie, Geoff Fuller, Humbug mugs, Scottish Potters association. Bookmark the permalink. A swirl that makes you squirm – I love that!